The obesity epidemic requires a paradigm shift. Several medical myths stand in the way of taking the most effective steps to safely help patients lose weight. The most important myth relates to saturated fat. Saturated fat consumption does not contribute to cardiovascular disease. This must be understood and accepted by the medical community so that sound advice can be given. Carbohydrate intake was positively associated with atherosclerotic progression (P = 0.001), particularly when the glycemic index was high. These findings should come as no surprise given the basic science of atherosclerosis. Oxidized and glycated LDL stimulate macrophages to become foam cells initiating the creation of plaque. Cellular receptors that allow macrophages to ingest oxidized LDL are specific for oxidized LDL. These receptors do not recognize normal LDL to a significant degree. Holovet et. al. studied the ability of oxidized LDL versus the Global Risk Factor Assessment Score (GRAS) to detect coronary artery disease. GRAS identified coronary artery disease 49% of the time, while oxidized LDL was correct 82% of the time. In a large prospective study, Meisinger et al found that plasma oxidized LDL was the strongest predictor of CHD events when compared to conventional lipoprotein risk assessment and other risk factors for CHD. Polyunsaturated fats are easily oxidized, saturated fats are not. It is the polyunsaturated fatty acids (PUFA) in the membrane of LDL particles that become oxidized and then initiate the cascade of inflammatory events leading to atherosclerosis. The major source of these PUFA in the American diet are “vegetable oils” (corn oil, soy oil etc.) rich in the omega-6 PUFA, linoleic acid. So why is this important to understand relative to the obesity epidemic? Because the most effective weight loss “diet” is arguably a low carbohydrate/high fat (LCHF) diet. This approach does not require calorie counting. This approach has been demonstrated to spontaneously reduce caloric intake whereas low fat diets require calorie counting and result in persistent hunger. When compared to low fat calorie restricted diets the LCHF approach has been equal or superior with respect to weight loss, insulin sensitivity, blood pressure reduction, and lipid profiles whenever these parameters have been measured. But LCHF has not been embraced by the medical community due to the perceived dangers of saturated fat consumption and a low-fat ideology that lacks legitimate scientific evidence. Once we dispel the mythology of saturated fat, the safety and efficacy of LCHF will be more readily accepted by physicians, the media and the lay public. The nutritional villains in our society are highly refined and easily oxidized “vegetable oils” filled with pro-inflammatory omega-6 PUFA (linoleic acid), added sugar (especially HFCS) so prevalent in most processed foods and soft drinks, and the nutrient poor wasted calories of processed flour foods. These three culprits are responsible for our epidemics of obesity, insulin resistance and metabolic syndrome. These three conspire together to generate fatty liver disease, atherosclerotic plaque, and chronic inflammation. When a LCHF approach is combined with eating only fresh whole foods and avoiding added sugar, refined flour, and unhealthy “vegetable oils”, we have the perfect recipe for our obesity epidemic. The following references provide examples of studies that have demonstrated the efficacy, safety and usual superiority of the LCHF approach to weight loss. The A to Z Weight Loss Study: A Randomized Trial, JAMA March 7, 2007, . On July 17, 2008, the New England Journal of Medicine published an article describing a two-year study of men and women in Israel. The study showed that, compared with the low-fat diet, the low-carbohydrate diet produced greater weight loss and had more favorable effects on lipids. Obesity (Silver Spring). 2007 Jan;15(1):182-7.The effects of a low-carbohydrate ketogenic diet and a low-fat diet on mood, hunger, and other self-reported symptoms. McClernon FJ, Yancy WS Jr, Eberstein JA, Atkins RC, Westman EC. Exp Clin Cardiol. 2004 Fall;9(3):200-5.Long-term effects of a ketogenic diet in obese patients.Dashti HM, Mathew TC, Hussein T, Asfar SK, Behbahani A, Khoursheed MA, Al-Sayer HM, Bo-Abbas YY, Al-Zaid NS. Acta Cardiol. 2007 Aug;62(4):381-9.Low carbohydrate ketogenic diet enhances cardiac tolerance to global ischaemia. Al-Zaid NS, Dashti HM, Mathew TC, Juggi JS. Exp Clin Cardiol. 2004 Fall;9(3):200-5.Long-term effects of a ketogenic diet in obese patients. Dashti HM, Mathew TC, Hussein T, Asfar SK, Behbahani A, Khoursheed MA, Al-Sayer HM, Bo-Abbas YY, Al-Zaid NS. Int J Cardiol. 2006 Jun 16;110(2):212-6. Epub 2005 Nov 16. Effect of a low-carbohydrate, ketogenic diet program compared to a low-fat diet on fasting lipoprotein subclasses. Westman EC, Yancy WS Jr, Olsen MK, Dudley T, Guyton JR.
2009 Nov-Dec;25(11-12):1177-85.Therapeutic role of low-carbohydrate ketogenic diet in diabetes. Al-Khalifa A, Mathew TC, Al-Zaid NS, Mathew E, Dashti HM. Mol Cell Biochem. 2007 Aug;302(1-2):249-56. Epub 2007 Apr 20. Beneficial effects of ketogenic diet in obese diabetic subjects.Dashti HM, Mathew TC, Khadada M, Al-Mousawi M, Talib H, Asfar SK, Behbahani AI, Al-Zaid NS. Mol Cell Biochem. 2006 Jun;286(1-2):1-9. Epub 2006 Apr 21.Long term effects of ketogenic diet in obese subjects with high cholesterol level. Dashti HM, Al-Zaid NS, Mathew TC, Al-Mousawi M, Talib H, Asfar SK, Behbahani AI. Nutr Metab (Lond). 2004 Nov 8;1(1):13. Comparison of energy-restricted very low-carbohydrate and low-fat diets on weight loss and body composition in overweight men and women. Volek J, Sharman M, Gómez A, Judelson D, Rubin M, Watson G, Sokmen B, Silvestre R, French D, Kraemer W.
Ann Intern Med. 2004 May 18;140(10):769-77. A low-carbohydrate, ketogenic diet versus a low-fat diet to treat obesity and hyperlipidemia: a randomized, controlled trial. Yancy WS Jr, Olsen MK, Guyton JR, Bakst RP, Westman EC. Nutr J. 2011 Oct 12;10:112. Effect of ketogenic Mediterranean diet with phytoextracts and low carbohydrates/high-protein meals on weight, cardiovascular risk factors, body composition and diet compliance in Italian council employees. Paoli A, Cenci L, Grimaldi KA. Arch Intern Med. 2010 Jan 25;170(2):136-45. A randomized trial of a low-carbohydrate diet vs orlistat plus a low-fat diet for weight loss. Yancy WS Jr, Westman EC, McDuffie JR, Grambow SC, Jeffreys AS, Bolton J, Chalecki A, Oddone EZ. Nutr Metab (Lond). 2008 Dec 19;5:36. The effect of a low-carbohydrate, ketogenic diet versus a low-glycemic index diet on glycemic control in type 2 diabetes mellitus. Westman EC, Yancy WS Jr, Mavropoulos JC, Marquart M, McDuffie JR.
Nutr J. 2008 Oct 26;7:30. Spanish Ketogenic Mediterranean Diet: a healthy cardiovascular diet for weight loss. Pérez-Guisado J, Muñoz-Serrano A, Alonso-Moraga A.
Vopr Pitan. 2007;76(3):29-34. Efficacy of low-carbohydrate diet in the treatment of obesity in adolescents]. [Article in Russian] Sorvacheva TN, Peterkova VA, Titova LN, Vitebskaia AV, Pyr’eva EA. Dig Dis Sci. 2007 Feb;52(2):589-93. Epub 2007 Jan 12. The effect of a low-carbohydrate, ketogenic diet on nonalcoholic fatty liver disease: a pilot study. Tendler D, Lin S, Yancy WS Jr, Mavropoulos J, Sylvestre P, Rockey DC Westman EC. This entry was posted in atherosclerosis, carbohydrate, carbohydrate restriction, cardiovascular disease, diabetes, health, health policy, heart attack, monounsaturated fat, nutrition, obesity, polyunsaturated fat, saturated fat, Sugar and tagged atherosclerosis, blood sugar, carbohydrate, cardiovascular disease, CHD, diabetes, diet, dyslipidemia, heart attack, HFCS, n-6 fatty acid, n3 FA, n6 FA, omega 3 fat, polyunsaturated fat, saturated fat, sugar on October 12, 2017 by Bob Hansen MD. Cartoon humor: A Prescription for Health! Hat tip to Tommy Wood MD, PhD for introducing me to this great cartoon. So what would happen if your doctor prescribed this? Would you be shocked? Would you follow the advice? 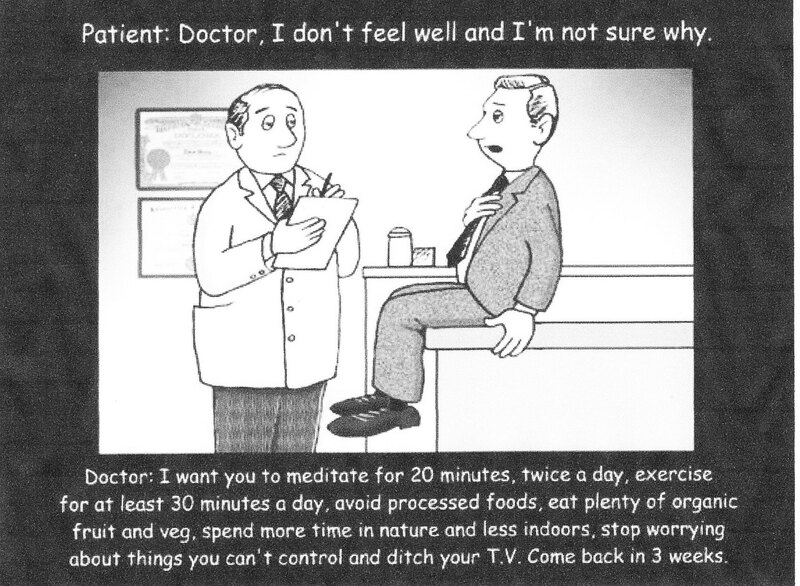 Sadly few doctors make such recommendations as explicitly as this cartoon and fewer patients follow the advice. How important are the elements in this advice? They are essential. We too often focus on dietary concerns at the expense of ignoring other important low hanging fruit. Early morning outdoor exercise with exposure to natural light in a green space, even on a cloudy or rainy day, is essential for health. Why? There are many reasons. Click the link above to read fitness expert Darryl Edward’s discussion with references. In fact outdoor exercise in a greenspace is more beneficial than the same exercise indoors. The reasons are many, including but not limited to Vitamin D production. Early daytime exposure to natural outdoor light helps to maintain our Circadian rhythm and align the biologic clock in all of our cells and organs with the central biological Circadian clock in our brain. Most folks do not know that we have a biologic clock deep within our brain and that all the organs and cells of our body also have clocks. They all need to be synchronized with each other and with the sun for optimal health. When they are not synchronized bad things happen. Night shift workers and other folks with disturbed sleep have higher rates of cancer , depression , hypertension, heart attack and stroke. Maintaining our circadian rhythm is vital to achieving adequate high quality restorative sleep. In turn, obtaining adequate restorative sleep contributes to lower cardiovascular disease risk in addition to four traditional lifestyle risk factors. Exposure to artificial light at night disrupts our circadian rhythm and impairs the onset of sleep. In medical school I learned that our retina has two cell types, rods and cones. But advances in science have revealed a third cell type called retinal ganglionic cells. These cells are particularly sensitive to blue light and directly connected to our central biological clock . Exposure to artificial light, especially from TV screens, computers, cell phones and other electronic devices after sunset disrupts our sleep cycle and delays the onset of sleep. That is why wearing blue light filtering glasses in the evening helps many folks to improve their sleep quality and duration. Sleep deprivation for even one night causes elevation in interleukin 6 levels the following day. Interleukin 6 suppresses immune function and excessive levels cause bone and tissue damage (especially cardiovascular). Sleep deprivation increases Stress hormones (cortisol, adrenalin), decreases prolactin and Growth hormone , and decreases the nightly production of ATP . Melatonin , often called the sleep hormone, is produced most abundantly during restorative sleep and essential for tissue healing, immune function, cancer prevention, and defense against tissue oxidation. These are just a few of the roles melatonin and sleep cycles play in determining our health.. So exercise outdoors in a green space daily to help synchronize your biologic clock with the sun, dim the lights in the evening and if you must watch TV or work on electronic devices before bed wear Blue Light filter glasses . Of course eating an abundance of colorful fresh organic vegetables and fruits, and practicing some stress reduction techniques every day are equally important and essential to health and functional status. Finally, not mentioned in the cartoon above is another healthy lifestyle choice, intermittent fasting (IF). IF will be discussed in the next post. Until then, sleep well, exercise regularly out doors in a green space environment, eat clean, learn and practice some regular stress reduction techniques and read the next post about IF. This entry was posted in atherosclerosis, cardiovascular disease, diabetes, evolution, exercise, health, heart attack, inflammation, meditation, sleep, stroke, Uncategorized and tagged cancer, cardiovascular disease, cardiovascular risk, CHD, CVD, heart attack, metabolic syndrome, obesity on February 1, 2017 by Bob Hansen MD. Sugar Industry paid Harvard researchers to trash fat and exonerate sugar! By now most of you have already heard about the study published in JAMA that reveals an unsavory historical scenario wherein the sugar industry funded an academic review paper that diverted the medical community’s attention from sugar as a vector for disease and erroneously placed it on saturated fat and cholesterol consumption. You can read about it by clicking on the following link. Here is the abstract of the article published in JAMA (Journal of the American Medical Association). This disturbing conspiracy reveals yet another industry sponsored distortion of science which had great impact on the health of our nation. The impact is accelerating today as the epidemics of obesity and diabetes rage out of control. But sugar consumption has not just been tied to obesity, diabetes, heart attacks and strokes. Sugar added foods and beverages have likely contributed to dementia, many forms of cancer and other chronic debilitating diseases. Sugar and refined carbohydrates mediate these effects by increasing systemic inflammation and contributing to insulin resistance. Inflammation and insulin resistance are pathways to many disease processes. Metabolic syndrome (pre-diabetes) is the hallmark combination of multiple abnormalities with insulin resistance as the underlying root cause. Prolonged insulin resistance leads to type 2 diabetes and contributes to heart attacks, strokes, cancer and dementia. In fact dementia is often referred to as type 3 diabetes, mediated in large part by insulin resistance in the brain. Here are links to discussions and videos relevant to these topics. I have previously provided links to the YouTube lectures given by the brilliant Dr. Jason Fung, These are worth mentioning again. Nina Teicholz is also worth a watch. And here is an important talk about sugar, refined carbohydrates and cancer. We did not evolve to eat lots of sugar! It is dangerous stuff. This entry was posted in atherosclerosis, cardiovascular disease, health, heart attack, nutrition, saturated fat, stroke, Sugar and tagged atherosclerosis, blood sugar, cardiovascular disease, cardiovascular risk, CHD, cholesterol, CVD, diet, heart attack, saturated fat, stroke, sugar on September 13, 2016 by Bob Hansen MD. This theme is repeated by medical journals that are “The Official Journal of the Society of >>>>>>” Just fill in the blanks for just about any medical society. Funding comes from big pharmaceutical companies the same way that funding in the nutrition Journals comes from large (junk) “food” manufacturers. Don’t get me wrong, there are plenty of very valuable, life-saving drugs out there. But most chronic human disease in developed societies is generated by various combinations of poor nutrition, lack of exercise, disruption of circadian rhythm, inadequate restorative sleep, stress and lack of social support systems. The obesity and diabetes epidemics continue to worsen yet the failed dietary advise of major health organizations is slow to respond to the data. Excess refined carbs (especially in the form of “food” made with flour) and added sugar (especially in the form of HFCS) are the major driving forces for obesity, diabetes and cardiovascular disease. Red meat is not the culprit, provided the meat is properly sourced (hormone and antibiotic free, grass fed) and cooked in a manner that does not create carcinogens and inflammatory mediators (cook with slow, low, moist heat, high temperature grilling and smoking cause problems, but that topic is for another post). Americans consume an average 130 pounds per year of added sugar and 140 pounds per year of refined flour. Those are averages so there are many people who consume more. The added sugar is not the white stuff people put in their coffee. It comes in all sorts of forms but is found in energy drinks, soda, lattes and mochas, salad dressing, ketchup, canned soups, canned vegetables, white AND whole grain breads, pasta (even “whole grain”), crackers, breakfast cereal, just about any packaged food that has more than one ingredient on the label. These foods represent 70% of the American diet. The problems created by this situation are enormous and will bankrupt our “healthcare system”. This is a cultural and economic problem. The solutions are simple but largely ignored in our society. We are creatures of habit and convenience. Eat whole foods, nothing from a package that has more than one ingredient. Eat meat, seafood, poultry, fresh organic vegetables (6-9 servings per day), fresh organic fruits, and nuts. Meat should be hormone and antibiotic free (free range, grass fed). Seafood should be wild. Poultry should be free range and the eggs should come from free range chickens, ducks, geese. Do not worry about eating fat as long as it comes from healthy animals and sources such as coconut oil, extra-virgin olive oil, avocado oil and clarified butter (ghee). Do not use any “vegetable” oils (corn, soy, and other oils from grains or seeds) The vegetable oils are highly refined and inflammatory. They contain easily oxidized omega 6 fats that feed the production of inflammatory mediators in your body and create oxidized LDL leading to atherosclerosis. Reduce stress with mediation, yoga, tai chi, dancing, engaging in fun sports and social activities. 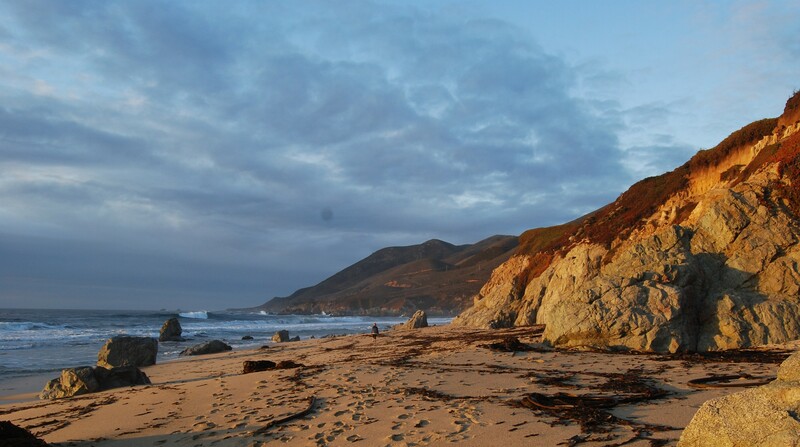 Walk on the beach, by a lake, river or stream, in the woods, listen to music. Get some sunshine regularly especially during the morning to get your circadian rhythm in order and to produce adequate amounts of vitamin D.
Spend time with family, friends and colleagues who are supportive and fun to be around. Get at least 7 hours of sleep per night. Avoid TV, computer screens and other electronic devices for at least 2 hours before bedtime. Unplug from the internet, email, etc on a regular basis. This entry was posted in atherosclerosis, cancer, carbohydrate, cardiovascular disease, diabetes, evolution, exercise, health, heart attack, hunter gatherer, inflammation, LDL, meditation, nutrition, obesity, sleep, stress, Sugar, Uncategorized, yoga and tagged blood sugar, CAD, cancer, carbohydrate, diabetes, diet, heart attack, HFCS, linoleic acid, metabolic syndrome, n-6 fatty acid, obesity, saturated fat, stroke, sugar on July 2, 2016 by Bob Hansen MD. In January I attended the annual meeting of Physicians for Ancestral Health. There were great presentations on many topics related to lifestyle and health. Take a look at the website linked below to learn about many topics relating nutrition, exercise, and lifestyle to health. I presented a lecture titled “The Lipoprotein Retention Model, What’s Missing?” This discusses many factors (root causes) that contribute to the formation of plaque in arteries and what can be done to prevent this insidious process by adopting a “Paleo Lifestyle“. Paleopathology and the Origins of the Paleo Diet. Keynote speaker Michael Eades MD, author of several books and a well known website. Medicine Without Evolution is like Engineering Without Physics– Randolph M Neese, MD Director of the Arizona State University Center for Evolution. The Roles of Intermittent Fasting and Carbohydrates in Cancer Therapy– Dawn Lemanne, MD, MPH, integrative oncologist. 23 and Me: Practical First Steps-Deborah Gordon MD, discusses a practical approach to utilizing information from this genetic test. Histamine Intolerance-Why (food) Freshness Matters– Georgia Ede MD. Mood and Memory: How Sugar Affects Brain Chemistry-Georgia Ede, MD. Systems Analysis and Multiple Sclerosis– Tommy Wood MD, author, blogger and lecturer, frequently interviewed on topics related to exercise and nutrition. This entry was posted in atherosclerosis, cancer, carbohydrate, carbohydrate restriction, cardiovascular disease, dementia, diabetes, evolution, exercise, health, heart attack, hunter gatherer, LDL, Sugar and tagged atherosclerosis, autoimmune disease, blood sugar, carbohydrate, cardiovascular disease, cardiovascular risk, cholesterol, heart attack, stroke on May 30, 2016 by Bob Hansen MD. Cure diabetes by fasting or eating less sugar and starch? No drugs involved. Jason Fung is a brilliant Canadian physician who has treated obesity and diabetes with a fasting protocol. Intermittent fasting produces physiologic changes similar to a low carbohydrate ketogenic diet (LCKD). Both approaches have been successfully used to treat diabetes, insulin resistance, obesity and metabolic syndrome. Learn why most medications that are used to treat diabetes do not address the underlying root cause by watching this video. So he read more about it and decided to try it. The results were stunning to this physician who became an ardent proponent of carbohydrate restriction. Now if you have not heard enough, listen to Eric C. Westman, MD, MHS who treats patients and teaches medical students and residents at the Duke University Lifestyle Medicine Clinic. A paleo diet in combination with carbohydrate restriction is arguably the most beneficial nutritional approach to diabetes, pre-diabetes and obesity. The data that supports this statement grows on a daily basis. You can read about why a LCKD should be the default diet for diabetes here. This entry was posted in carbohydrate restriction, cardiovascular disease, diabetes, LOW FAT DIET, metabolic syndrome, nutrition, obesity, saturated fat and tagged blood sugar, diabetes, diet, dyslipidemia, medications, metabolic syndrome, obesity, sugar on March 14, 2015 by Bob Hansen MD.